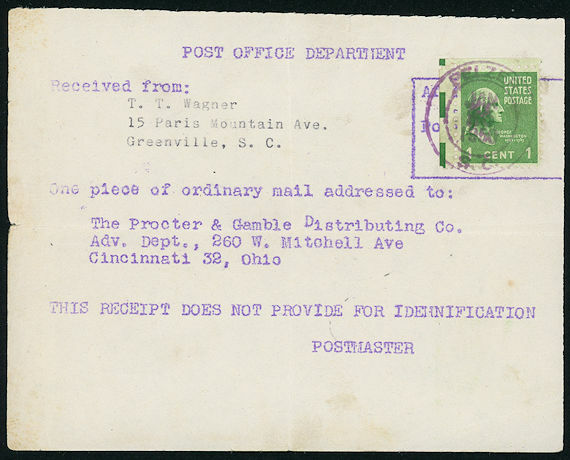 Certificates of mailing were available on fourth class parcels only until July 1, 1929, when the service became available on all classes of mail. 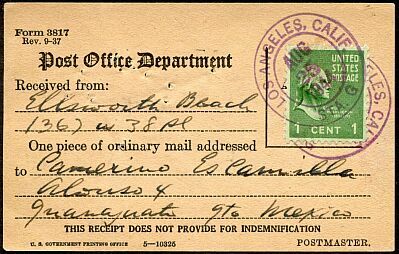 Three postal forms were originally available for certificates: sheet Form 2965, tag Form 3817 and mailing book Forms 3882 (5 entries per page), 3877 (15 entries per page) and 3881 (30 entries per page.) At some point a form for packages sent to PUAS countires was added. 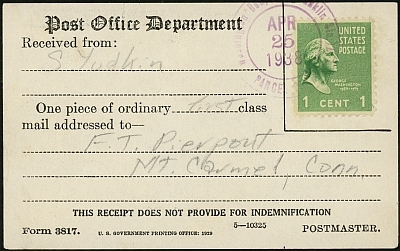 An original Form 3817, used on the first day of issue to certify the mailing of one piece of ordinary mail from Washington, DC to Connecticut. Since the one-cent Prexie was the first to be issued, this is the first day of the Prexie series as well. The one-cent certificate rate ran from September 1, 1915 until February 1, 1954. Form 3817, Revised, used to certify the mailing of one piece of ordinary mail to Mexico. Since the form had been revised in 1937, most examples with Prexies are on this revised version. 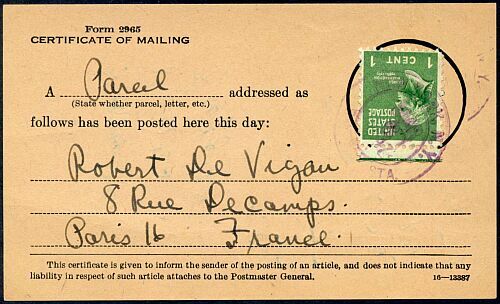 At some point the same certificates of mailing were also available on the backs of postcards so they could be mailed to a third party. This is either an emergency Form 3817 produced by a local post office or one made up by a specific user. The latter is most likely, as "indemnification" is spelled "idemnification" on it. But then, it was spelled the same incorrect way on the postcard above it. 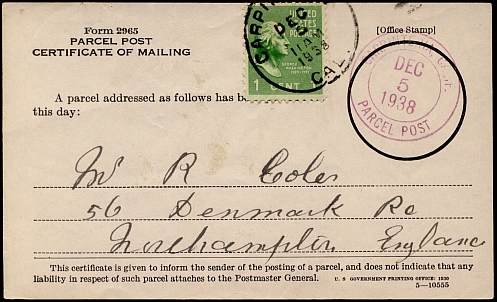 Certificates of mailing to UPU countries were only available for parcel post packages from May 26, 1932 until January 1, 1934, when they became available for all ordinary mail. The fee was one cent from May 26, 1932 until February 1, 1954. There is some indication that Form 2965 was intended for use with parcels sent to foreign addresses, but this was not specified in the regulations. This Form 2965 specifically stated it was for parcel post use even though by the time it was issued it could be used for other classes of mail as well. 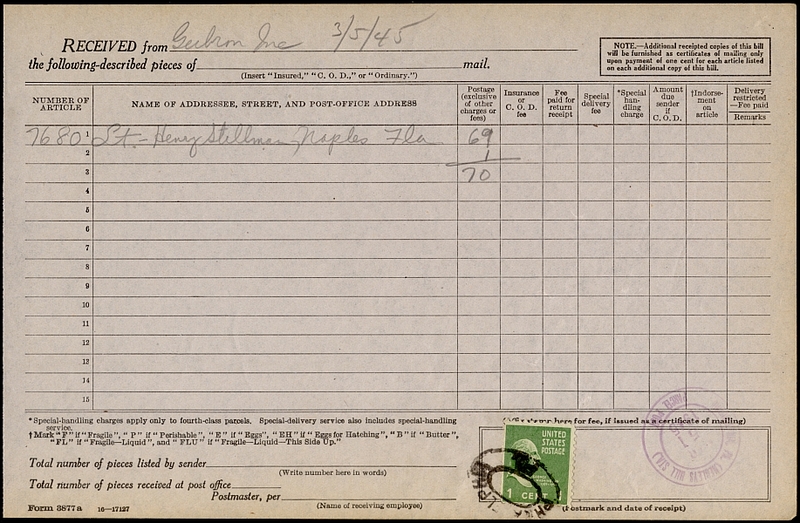 This version of Form 2965 was revised to remove the reference to parcel post at upper left, and has no edition number at lower right. 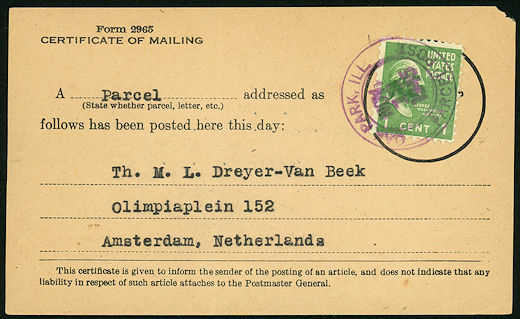 It was used to send a parcel to The Netherlands in November of 1945, not long after postal services were re-established after World War II. This version of Form 2965, used in 1947, has an edition number at lower right. This form 3882 provides a certificate of mailing for as many as five items, but was used here to certify mailing of only one. A revised Form 3882. The main difference is the removal from the instructions of the sentence "Diagonal mark must be drawn through lines not used." This is mailing book Form 3877. It could be used for as many as fifteen items. 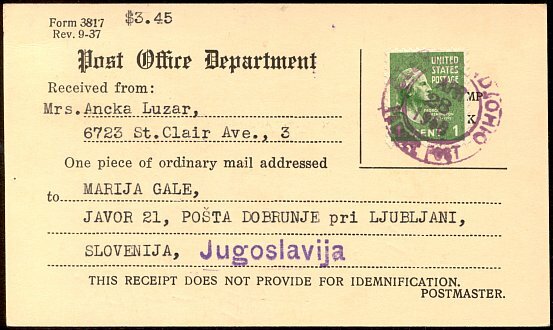 A special certificate of mailing form for packages sent to a PUAS country.